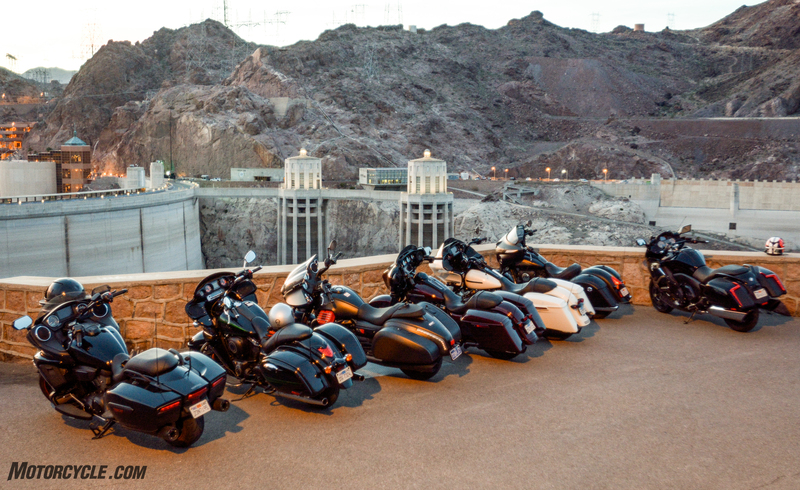 Hurtling through the pitch black desert at legal-plus speeds on a collective 5,800-pounds of the best Baggers on the market was an experience those of us on the Big Dam Bagger Tour will likely cherish long into our senile years. Compiling seven bikes for a shootout at the same time can be a logistical nightmare. Compiling bikes, clearing schedules, and gathering guest test riders takes some planning. We had quite the motley crew including a slew of recently departed editors (Dirty Sean Alexander, Scott “the Frenchman” Rousseau, and Brent “J00py” Jaswinski) as well as guest tester, the king of innuendo, Thai Long Ly and our videographer’s hetero life mate Nick to fill out this seven bike shootout. Come to think of it, lifer Johnny B and the young’n R.Adams are the only two left to tell the tale. Thankfully John’s account of the voyage is here to grace the digital pages of Motorcycle.com and will hopefully be here long after Burns scurries off into a comfortable early retirement. The BMW K1600 B, Indian Chieftain Dark Horse, Kawasaki Vaquero, Harley-Davidson Street and Road Glides, Moto Guzzi MGX-21, and Yamaha Eluder all put up a good fight scrapping for the top spot in our comparison. Check out the Big Dam Bagger shootout for one of MO’s largest shootouts of 2018 and to see who ended up on top. Every once in a while, a shootout comes up that needs a little more adventure thrown at it than our usual Southern California stomping grounds can provide. 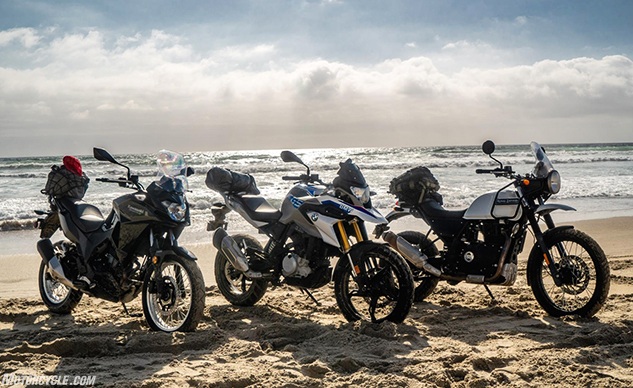 For our comparison of the BMW G310GS, Kawasaki Versys-X 300, and Royal Enfield Himalayan, we pointed our small-displacement adventure bikes south of the border to show that size doesn’t matter, it’s all about how you use it. Come along with the MO crew as we travel the Ruta de Vino through the Baja peninsula. From blasting through olive groves to being offered ayahuasca, our three amigos show that adventure is what you make it in this zany three-bike shootout. The small displacement category is hot right now. Hot enough for Troy to convince the people upstairs that we would need to devote multiple days of travel and shooting to our 2018 Lightweight Sportbike Shootout. The fellas spent time blasting around in town and on canyon roads to showcase the real-world usability of these bikes, and then headed north to Laguna Seca to rip around the racetrack. 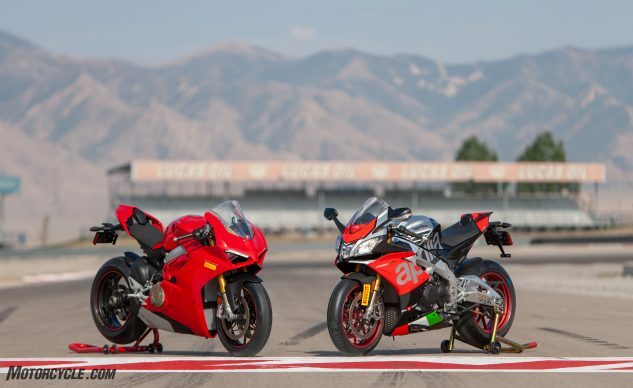 Turns out, no matter what your skill level, these bikes can be an economical way of commuting or an absolute blast at the track all while spending significantly less than one might on a larger motorcycle. Was Johnny B really pulling away on the Honda in our feature image or was this photo staged? Is Tom Roderick that big in real life? What kind of Asian is Troy Siahaan?! 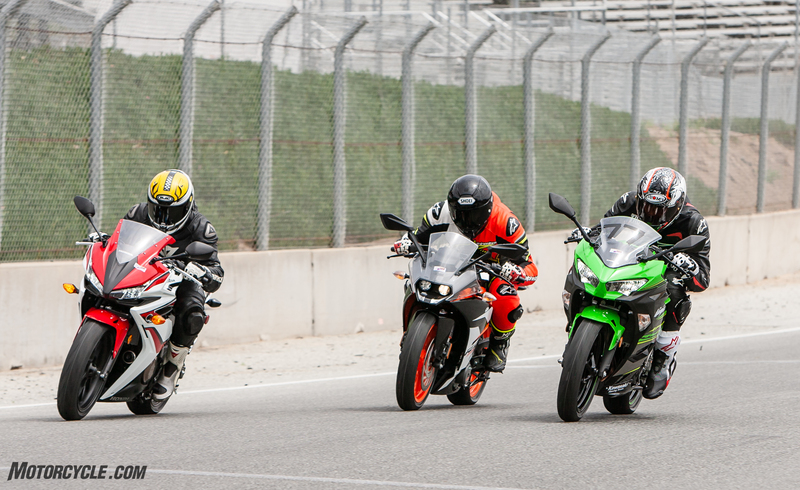 All of these questions and more are answered (not really) in our 2018 Lightweight Sportbikes Shootout! Ah, yes the adventure bike segment. Brimming with heavy, yet capable, world-crossing ADV tourers. 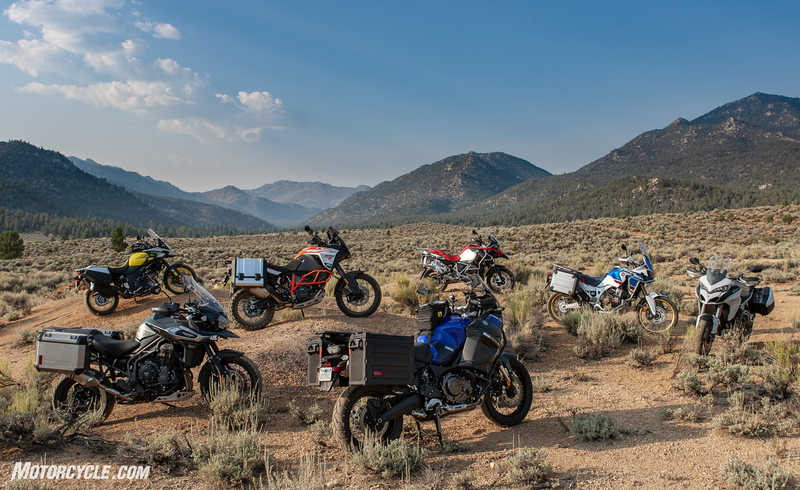 Pitting the top seven adventure bikes on the market right now against each other in the southern Sierra Nevadas seemed like a great way to showcase each bike’s strengths and weaknesses. Plenty of riding on-road on the way to and fro, with miles of trails and fire roads in Kennedy Meadows to explore. Alas, our shootout was fraught with drama, hardships, and busted Hondas. 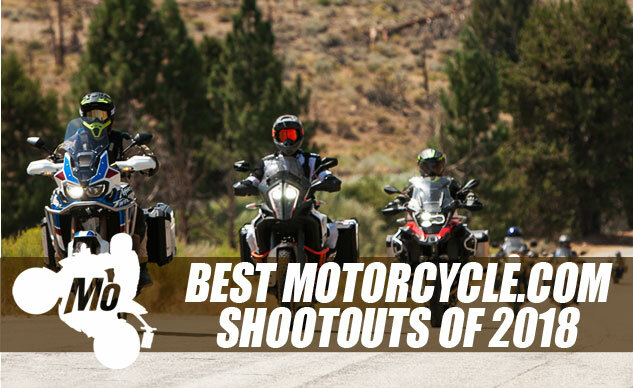 Through adversity, we would persevere, to bring you not one, but two parts of our Big Bore Adventure bike shootout. To be honest, it became a better and more thorough test after splitting the street and dirt test. Check’em out to see how these Starbucks-crushing behemoths stacked up against each other in the shootout of the century. Naturally, when Ducati announced the Panigale V4, most of the MO editors found their pants suddenly and awkwardly tightening. Our love of V4s has been smeared across the sticky pages of MO for many years thanks to Aprilia’s V4 platform both in RSV4 and Tuono trim. Tory Sealyhands brought these fire-breathers together for a proper shakedown with racy guest testers at exotic racetracks (Utah Motorsports Campus) and a thorough street test to show what it’s like to run errands on superbikes. This is a must read for those looking for a thoroughness rarely seen amongst the webz.